India is full of beautiful palaces and forts that have been turned into hotels. However, sometimes getting away from it all in the middle of nowhere is equally attractive, and to do that one may have to camp. But this isn’t camping as we know it: this is pure luxury. 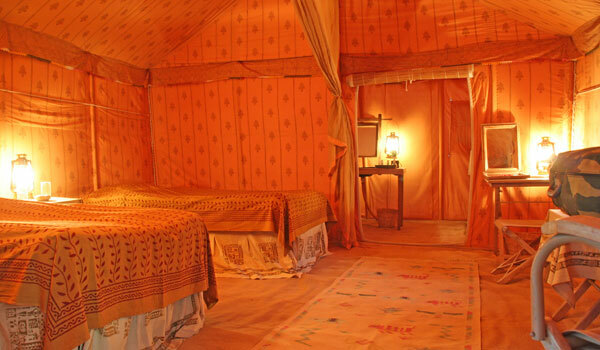 Below, find our round-up of the best tented camps in India. The only way to experience the desert in style, this super-luxe camp and spa is set on a private estate outside the walls of the ancient city. The standard tented suites clock in at over 1,000 square feet while the luxury suites come with a private walled garden and a heated private pool. Guests are encouraged to go on camel safaris into the desert, explore the historical fort or view the wonderfully inticate Jain temples. With the Suján spa to help unwind after a long day, The Serai is the perfect desert tented camp. Only open from October to April this wonderfully luxurious camp in Ranthambore is the perfect place to come and spot tigers. Set on the edge of a lake the 10 tents are almost unparalleled in their luxury and coupled with the Aman’s attention to detail the service is taken to another level. 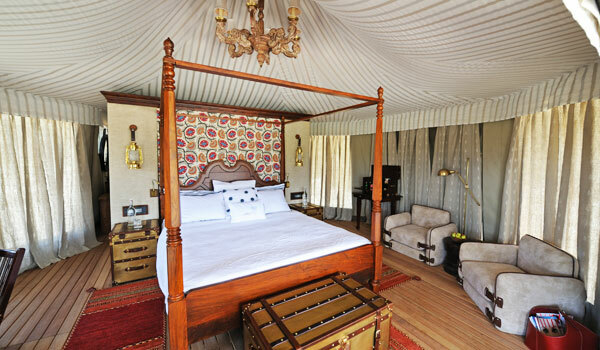 Each tent is air-conditioned, filled with exquisite furniture and scattered around the resort to ensure privacy. There is a separate spa and dining tent as well as a more constructed swimming pool and outdoor seating around a fire pit. Slightly more permanent structures, these extremely comfortable suites come with tented rooftops, four-poster beds, roll-top baths and dark-wooden floors. Each tent is set in its own walled garden to maximize privacy. Being in the heart of Ranthambore, Vanyavilas is all about finding the tiger habitats and watching them in action, after which there is a spa to help relax after some bumpy game drives. 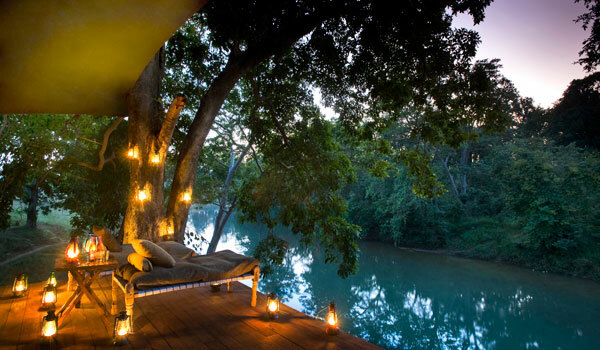 This is true luxury in the heart of the jungles of remote central India. 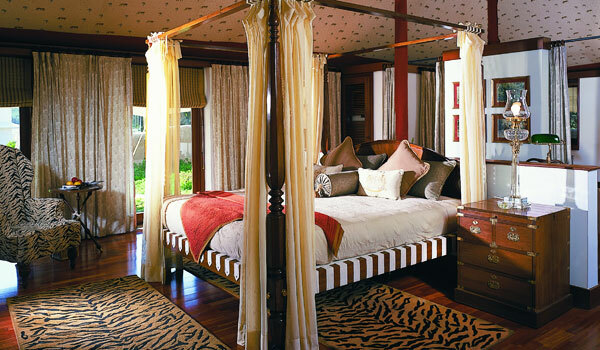 There are two sets of tented camps, each consisting of nine suites. The old-fashionedly elegant tents sit on raised platforms overlooking the river and the wilderness beyond. 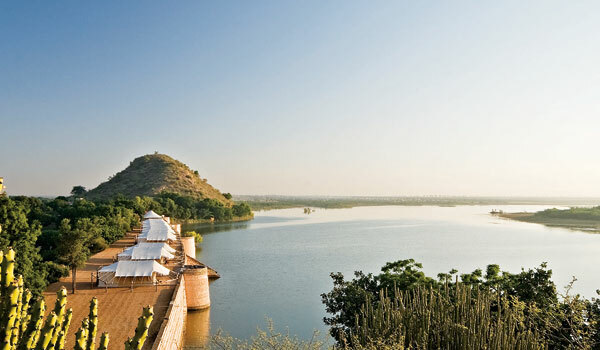 Like the Ranthambore camps, Banjaar Tola is all about tigers and wildlife viewing. The camp is also noted for leopards, sloths, and Indian wild dogs. A movable feast, the Royal Tented Camp migrates around India to coincide with some of its most iconic festivals – the Pushkar Camel Fair, out in the desert of Rajasthan, the World Spirit Sufi Festival that takes place in the Mehrangarh Fort in Jodhpur and the annual livestock fair at Nagaur. The tents are decorated in warm Indian fabrics and while not as luxurious as some of their counterparts above, they are the ideal way to immerse yourself in the festivities. 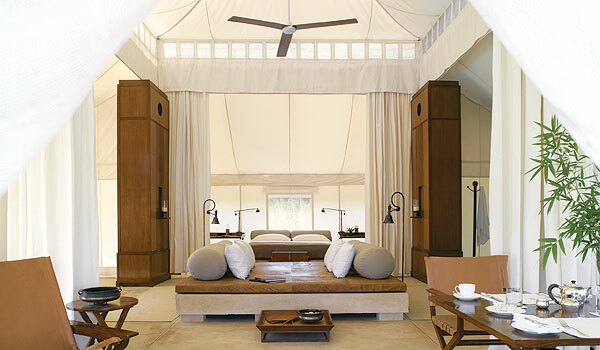 Marbela Beach is a tented camp on the sands in Goa where guests are housed in a modern take on the classic safari tent. All of the tents are set slightly back from the beach, where day beds and a beach bar mean that guests really don’t have to worry about much. There’s an onsite spa and Marbela Beach runs yoga sessions to keep guests supple and limber.